This is a media release cross-posted from the Aquarium's Rescue Blog. Find out how you can support the Aquarium and their efforts to rescue and protect endangered animals here. With more than 100 rescued sea turtles in care at the Aquarium's Animal Care Center, the rescue team is transferring 18 stable animals all over the East Coast to make room for the ever-growing number of cold-stunned sea turtle patients. The mass stranding of hypothermic sea turtles on Cape Cod reached a new peak Thursday as 22 more of the endangered and threatened marine reptiles were collected by Massachusetts Audubon staff and volunteers and transferred to the New England Aquarium's rescue facilities in Quincy. Since Monday, 67 animals of three different turtle species have been found stranded on Cape Cod Bay beaches with body temperatures in the mid to high 40's. This loggerhead sea turtle was among seven that were rescued in a 24 hour period from November 27 to November 28. That many loggerheads is more than usually are seen in an entire two month stranding season. The mass wash-up of cold stunned sea turtles on this scale is believed to happen no where else in the world. Sick sea turtles do strand each November and December on Cape Cod. The Aquarium's record for treating sea turtles that arrive still alive is 144. Yesterday's 22 new patients pushed this season's total to 107 animals received, and Aquarium officials think that might just be at the half-way point. Compounding the massive volume and pace of the strandings is a new phenomenon of a record number of large loggerhead sea turtles arriving. Usually, 90 percent of the sea turtles that strand are 2 to 12 pound juvenile Kemp's ridleys. 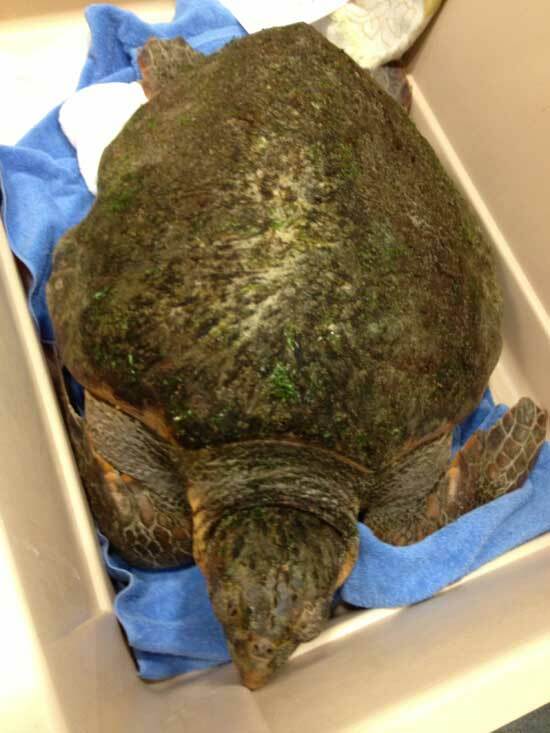 On Wednesday and Thursday, eleven 50 to 100 pound loggerheads arrived. In a normal year, the Aquarium might handle four or five of the husky, chestnut brown turtles in an entire season. The big turtles quickly fill tank space in the Aquarium's state of the art rescue facility which is optimally designed to handle about 100 smaller turtles. To make space for more incoming turtles, the Aquarium has been reaching out to fellow marine animal rescue facilities and aquariums up and down the East Coast. Thursday, eight re-warmed and stable Kemp's were driven to the National Marine Life Center on Cape Cod. Friday, four more Kemp's will be flown out of Norwood to the Virginia Aquarium on a donated flight from Lighthawk, which is a network of private pilots that help move endangered wildlife around the U.S.
Also Friday, six big loggerheads will be transported to the University of New England in Biddeford, Maine. Later this week, Worcester-based Polar Beverages will fly more sea turtles to Maryland and Georgia. The Aquarium is grateful for both the generosity and expertise of these partners in helping save endangered sea turtles. See what Thanksgiving is like in the turtle rescue ward. Walk the beaches with a volunteer searching for sea turtles. Get a feel for the early days of the sea turtle stranding season here and here. And check out a day in the life of the turtle rescue team.